and Former New York Times "Ethicist"
Join comedian Judy Gold, former NY Times "Ethicist" Randy Cohen, Rabbi Capers Funnye (Michele Obama's cousin) and others for talks about Jewish Humor, Greek Culture, Ethics and more as part of Will to Learn: A Day of Talks Honoring the Great Minds of Terezín on Sunday, Jan 22. This daylong program is inspired by the over 4000 lectures given by the inmates of the Terezín Ghetto. An extraordinary group of experts will offer their interpretation of the topics presented at Terezín. Share the experience with a friend, and bring them as your guest for free. Click Here or visit 92YTribeca.org/TerezinTribeca and enter TZTWO in the Promo Code box. Then click "Buy Tickets". Will to Create, Will to Live: The Culture of Terezín is generously supported by The Rita Allen Foundation; and The Harold W. and Ida L. Goldstein Lecture Fund through the Estate of Sanford Goldstein. Additional support is provided by an anonymous donor; Suzi and Martin J. Oppenheimer; UJA-Federation of New York; the Austrian Cultural Forum; the Czech Center New York; and the Consulate General of Israel in New York. 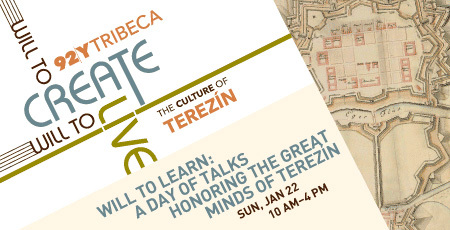 Visit 92y.org/Terezin to Learn more about Will to Create, Will to Live: The Culture of Terezín series.